Thor Axe performs alongside Bit Brigade at Off Broadway on Saturday night. 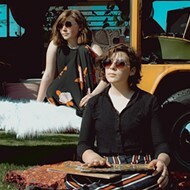 Taking a sideways turn from the last few weeks of tribute shows and cover bands, our guide to the weekend ahead offers up wholly original acts with an odd video game group thrown in the mix. And KDHX, the bastion of community radio in St. Louis, celebrates its 30th birthday with a free festival at the corner of Washington and Grand that ends in a parade led by the Saint Boogie Brass Band. Think of the list below as ten reasons to leave your house in the next three days. If you can think of any more, leave them in the comments section. 7 p.m. Old Rock House, 1200 South Seventh Street. $15-$18. 314-588-0505. If you’ve never heard of the Backroad Boys, that’s understandable — the band is a newly formed supergroup of sorts. A quartet, its elder statesmen are Kevin Welch and Michael Fracasso, who helped birth the Americana genre in Nashville and Austin in the early ‘80s. They’ll be joined by Welch’s son, Dustin, a formidable, Austin-based country-rocker in his own right. And then there’s John Fullbright, an Oklahoma farm boy who could get in the ring with Jason Isbell and James McMurtry and hold his own. Fullbright, an NPR darling known for his vivid lyrics, is more than a singer-songwriter. With the Backroad Boys, he plays keyboards with the aplomb of a fast-fingered organist in a Baptist band, noodling anxiously between tunes. Not being familiar with the group yet is fine. But skipping its show this week at the Old Rock House? Well that would be just plain stupid. 8 p.m. Off Broadway, 3509 Lemp Avenue. $10. 314-498-6989. As an expert gamer takes center stage under a projected screen to play through Nintendo classics of yore (think Zelda, Metroid and more), Bit Brigade offers up arrangements of the game's soundtrack in real time. In this case, the band will follow 1988 classic Mega Man 2, playing everything from stage themes for each robot master to the oh so iconic boss music. Sure, the group could play to a pre-recorded video, but it opts to make the gamer on stage part of the band — as vital as the drummer or guitarists. It's a spectacle for fans of music and video games alike, especially when the unexpected happens on-screen and Bit Brigade is tasked to react. 8 p.m. The Ready Room, 4195 Manchester Avenue. $15. 314-833-3929. Mike Hadreas has continually drawn, erased, and redrawn the contours of his project Perfume Genius over the outfit’s four-album period. What began as spare but tuneful confessionals adorned with piano and cheap keyboards has morphed into a lithe glam machine while still emphasizing his strengths as a songwriter and performer. His music and persona are both proudly queer, and his songs approach identity from interior and exterior perspectives. Songs on this year’s No Shape makes overt references to icons like Bowie and Prince and Kate Bush, but Hadreas and his supporting players (including, on “Sides,” Weyes Blood’s Natalie Mering and Hadreas’ longtime partner Alan Wyffels throughout) makes space for smartly glossy pop music all his own. Thrashamania 8 w/ Hell Night, Cross Examination, Path of Might, Voidgazer 7 p.m. The Firebird, 2706 Olive Street. $10. 314-535-0353. Technically, this year's iteration of Thrashamania runs two nights with Saturday's event offering touring acts in Manic Outburst, Plagued Insanity and King Goro (and locals Tropical Storm! and ThorHammer in tow). But few shows in town actually embrace Friday the 13th and this locals-only kick-off injects the 1980 classic film before and between a few of St. Louis' seediest bands. 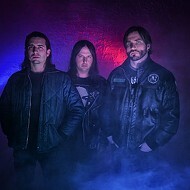 This night preempts "Hallowed Gate Style," the upcoming album from Path of Might set to release in November, so concertgoers can expect a live preview of what's to come, a "try before you buy" kind of deal. 8 p.m. Atomic Cowboy Pavilion & The Bootleg, 4140 Manchester Avenue. Free. 314-775-0775. We've all come across those videos, you know the ones, where a metal band does its take on some famous pop song or a TV show theme. These perfect and polished viral pieces aren't made in a lab — bands such as Summer Youth make this stuff in their spare time. While its pop-goes-punk cover of "There's Nothing Holding Me Back" by Shawn Mendes might get Youtube hits, the band's own songs are proper rock and roll gems punctuated with ten exclamation marks. Those looking for more grit and candor shouldn't look past local opener Van Buren, whose harsh and angular metal feels biting and deceptively dark. 9 p.m. Kismet Creative Center, 3409 Iowa Avenue. $5-$7. 314-696-8177. Stavanger, Norway-native Gaute Granli makes string-based schemes that unravel atop disparate crooning. His deconstructed songs delve into self-parody, always to be laughed with and never at. As the foundation of each piece starts to crack, percussive noise is injected to keep the sound somewhat stable, although smooth-listening is rarely an option. The words feel foreign but the language being used will be familiar to fans of rock and roll. The proprietor of Close/Far Recordings and the BRUXISM concert series, NNN Cook rounds out the event with his own minimalist machinations. 8 p.m. Way Out Club, 2525 S. Jefferson Avenue. $7. 314-664-7638. We can all safely assume that attention spans will be reduced to roughly three seconds by 2067 so, for that reason alone, Giant Claw feels 50 years ahead of its time. The sordid creation of Ohio-based artist and Orange Milk Records founder Keith Rankin, Giant Claw makes a mosaic with grout made from nuclear waste. This is the sound a sophisticated AI might hear as Nibiru collides with Earth, but you get to hear it from the corner of Jefferson and Gravois in south city. 7 p.m. Delmar Hall, 6133 Delmar Boulevard. $25-$28. 314-726-6161. Issues calls itself "intercoastal heavy pop" and while that does sum up the band's cross genre vibe, its transitions are smooth, inventive and close to hip-hop and nu metal without aping either sound. This style isn't easily read but it is easy to digest, and the songs come with a level of polish befitting the most proper of radio rock. A recent video on Issues' Facebook throws an open challenge out to any of its fans who think they can beat the band at Super Smash Bros. and if anyone were to question the sincerity of their nerdom, just check out this cover of the Pokemon theme song at Warped Tour 2016. 11 a.m. Grand Center, N. Grand Boulevard & Lindell Boulevard. Free. 314-533-1884. Three decades of independent radio in St. Louis seems substantial, but the station still maintains its underdog vibe not unlike its humble start in the mid-eighties. Running concurrent with the "POWER THE TOWER" campaign, KDHXFest sets aside its fundraising efforts (a need for community stations of this ilk) for a free day-long celebration of local music ranging from Blues to Indie Pop, Bluegrass and, of course, classic Rock and Roll. Bombay Food Junkies, Juicemasters and Celementine's will all have food trucks on premises to keep concertgoers satiated from Old Salt Union's live on-air performance at 11 a.m. to Saint Boogie Brass Band's parade to Urban Chestnut at 5:45 p.m.
7 p.m. The Firebird, 2706 Olive Street. $15. 314-535-0353. The name alone feeds into popular post-rock memes of long-winded names scrawled across dreamy landscapes, but the band in question lives up to the drama and tension that its name elicits. 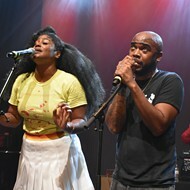 Since its debut in the late aughts, the group has had sixteen releases, including split EPs with Tigers Jaw, Code Orange (then known as Code Orange Kids) and tour mates Rozwell Kid. On this tour the band runs seven strong, which helps to peel off the densely packed layers of the discography with several delicate hands.